We played the Galmanche scenario from the rule book, part of the British and Canadian push on Caen, which took place on July 8, 1944. The scenario is a set piece assault on a German hedgehog held by a dismounted panzergrenadier company of the 12th SS and their single AT gun. The men of the fresh 59th Division were tasked with evicting the Germans from all five buildings with three platoons and two troops of tanks. Captain Lee and Lieutenant John decided a hard fast push along the left side would be the best chance, starting with seizing the three farm buildings. The woods to the front were impassable to armor, so the British tanks had to go left or right, making continuous infantry support difficult. 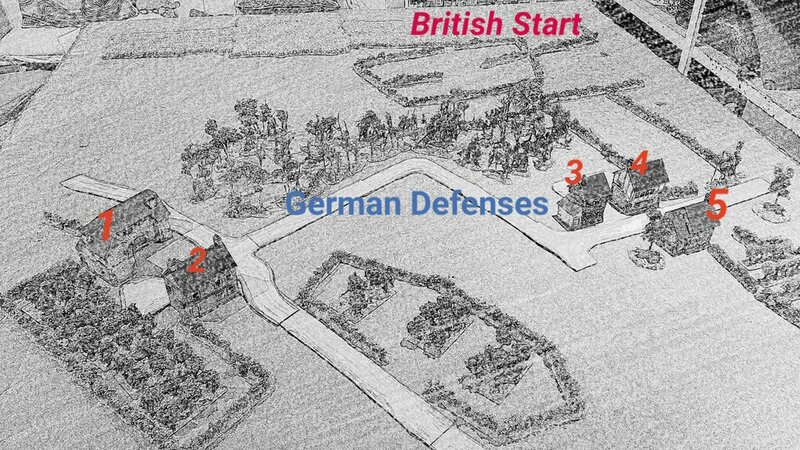 They allocated two preliminary bombardment boxes on the three farm buildings on the left flank and two on the left side of the heavy woods to their front. The Germans were commanded by Captain Will and Lieutenant Rick. They dug in their single Pak 40 75mm AT gun on their left flank, near the Chateau. The artillery observer (with 4 off board 8cm mortars at his command) burrowed into the front of the woods, toward the German left, but with a view of the entire British avenue of approach. Platoon 1 was spread across the front woods, but more heavily to their left flank. Platoon 2 occupied the area around the three farm buildings. Platoon 3 occupied the orchard in the middle center of the German position. As it happened, the British barrage was extremely successful. The tank killer squad and the panzerschreck team and one squad of Platoon 1 were clobbered and sent reeling. All of Platoon 2 in the farm buildings were hit so heavily with shock that they had to route to the rear of the farm orchard. The way was at least temporarily clear for the British to push far and fast on their left. Knowing from historical reports of the actual battle that the British assault faltered when it failed to "keep up with the barrage", Lee and John made no such mistake. The British first platoon pushed vigorously up the left followed by the Cromwell tank troop. The British 2nd platoon pressed across the hedge toward the woods and were immediately slapped by the two unharmed German squads in the woods the their right. Two British squads melted away, but the supporting Shermans and the remaining British squad eventually battered and drove off the remains of the German front line. Meanwhile, the British first platoon occupied the three farm buildings without any fight and began to turn toward the center, with their Cromwell tank troop close up in support. The British Platoon 3 remained on blinds and swiftly moved past the farm buildings and into the farm orchard, only to discover itself in close combat with the recovering remains of German Platoon 2. This massive and swift close combat wiped out the Germans, bagging so many prisoners that the Brits had to detach a squad to march off their captives. The remaining two slightly damaged squads of Platoon 3 took up position facing the center of the board, cheek-by-jowl with Platoon 1. The British had enjoyed it all their way so far (except for having Platoon 2 badly bashed up), but that was about to change. The British started to push out across the center of the board without much in the way of reconnaissance and soon discovered a flurry of panzerschreck, panzerfaust, and MG fire coming their way. One squad was wiped out, and one Cromwell brewed up. At this point, the Germans finally succeeded in getting their mortars to drop. The only thing in the target area was the Sherman platoon, which had just finished up wiping out or driving off the last Germans in the woods. The mortars merely scratched the paint work input on a couple points of shock which were soon cleaned up. When the Shermans next activated, they decided to move out of the target zone and inch up around the right flank. If the Captain in personal command of the dug in and camouflaged AT gun had waited a bit more, he might have lured the whole platoon around the corner and to their doom.. But as it was, he shot the first one and blew it to Kingdom Come. The others stopped to ponder their options. At this point, it was pretty clear we were heading toward a possible stalemate, and time was running out. So we called it over and did the always enjoyable post mortem. The British had lost two tanks and had two reduced platoons and one whittled to a single squad. Seizing the Chateau and barn, even though the Germans had only two intact squads, was going to be hard since their little fortified orchard covered the approaches to the buildings. The Germans likely would have fought as long as their panzerschreck crew lived and then retreated from the middle orchard and taken up positions in the Chateau and its orchard, which would have turned it back into an old-fashioned infantry fight with little room for the tanks to help. Still, the Brits had a chance to eject all the Germans. Well played by everybody. I particularly applaud the Germans for being so philosophical and accepting as their brains were being bashed in while the fates kept their chits from bring pulled!